Philip Schuyler was one of the highly visible figures in the American Revolution, especially in the way it affected New York State. He was a delegate to the Second Continental Congress which met in Philadelphia in May 1775. The Continental Congress appointed him to be one of the four Major Generals in the War of Independence, commanding the northern department, headquartered in Albany, New York. His position was a critical one, because the northern department had to deal directly with the British who still had full control of what is now eastern Canada, consisting of Ontario and Quebec. A combination of health problems and political maneuvering created considerable problems for Schuyler and he was forced to temporarily appoint Richard Montgomery to command the planned invasion of Canada. When Montgomery became disabled, General Schuyler was able to step in to direct the expedition to Johnstown in 1776. Considerable bickering within the fledgling Revolutionary Army caused Schuyler to permanently resign from the Revolutionary Army in April 1979. For a period of time, during the year 1779, he remained a military advisor to General George Washington. During the colonial period, preceding the Revolutionary War, Schuyler had been able to accumulate considerable expeditionary war experience in the Colonial Provincial Army during the Seven Year War. He had quickly risen to the rank of Major General and participated in the battles of Lake George in 1755, Oswego River in 1756, Ticonderoga in 1758 and Fort Frontenac also in 1758. His background during these campaigns against the French and the Indians had prepared him well militarily and he was an obvious solid choice to command the northern command when he was appointed by the Second Continental Congress. During the early revolutionary period, Schuyler had been a delegate to the Continental Congresses, and in 1788, he became the first U. S. Senator from New York State in the newly formed U. S. Congress. He served in that capacity until 1791. He again served in the U. S. Senate from 1797 to 1798, when he had to resign from the U. S. Senate for health reasons. During the time interval between his two U. S. Senate appointments, he was a member of the New York State Senate from 1792 to 1797. Prior to his U. S. Senate service he also had served in the New York State Senate from 1780 to 1784 and from 1786 to 1790. During his government service as U. S. Senator and as a New York State Senator he was a strong advocate for the Lake Champlain Canal, connecting the Hudson River with Lake Champlain and later for the Erie Canal connecting the Hudson River with Lake Erie at Buffalo, New York. Philip Schuyler was married to Catherine Van Rensselaer, a great great grand daughter of Killian Van Rensselaer, the original founder of the Dutch colony, named Rensselaerswyck, around the Albany region of eastern New York. The couple was married on September 13, 1755. They had eleven children, three of whom had some claim to fame. Their son, Philip Jeremiah Schuyler, served in the U. S. House of Representatives, their daughter, Elizabeth, was married to Alexander Hamilton, and another daughter, Margarita was married to Stephen Van Rensselaer III, the eighth Patroon of Rensselaerswyck. 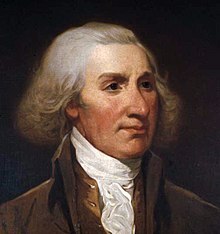 Philip John Schuyler was born in Albany, New York, on November 20, 1733. At that time the family was already quite wealthy, although the family came from humble origins. His father, John Schuyler, Jr. was the third generation member of the family in the new world. Philip’s mother was Cornelia Van Cortlandt, a member from another prominent Dutch American family. Philip’s grandfather, Peter Schuyler [1657-1724], was the first mayor of Albany, New York. Philip’s great grandfather, Philip Pieterse Schuyler [died 1683], had migrated from Amsterdam, The Netherlands in 1650. General Philip John Schuyler passed away on November 18, 1804. He was buried with full military honors in the vault of General Abraham Ten Broeck. His remains were later re-interred in the Albany Rural Cemetery. In 1871, a Doric column of Quincy granite, 36 feet tall, was erected in his memory. See the appendix at the end of the bio profile for Pieter Schuyler [1657-1724] to understand the relationship, if any, between the eight Schuylers in this listing. “PROMINENT DUTCH AMERICAN ACHIEVERS: GOVERNMENT, MILITARY, HISTORY AND PHILOSOPHY”, 2012. “FIFTEEN PROMINENT DUTCH AMERICAN FAMILIES: THE VAN BURENS, KOCH BROTHERS, VOORHEES AND OTHERS, 2015. “PROMINENT DUTCH AMERICANS IN U.S. GOVERNMENT LEADERSHIP POSITIONS, 2015.
water up out of his head."